Happy White Supremacist Columbus Day. Today, for those outside of the United States who wonder what this “holiday” is all about, is a celebration of a man who lead a military expedition to Hispanola with the apparent goal of reaching India and killing everyone or enslaving them. But due to his massive lack of maritime knowledge and complete disregard for common sense and complete dearth of research into geography or anthropology he arrived in the very near Caribbean where he landed, called it India, and began on his zealous attempt to kill all of the inhabitants as quickly as possible. 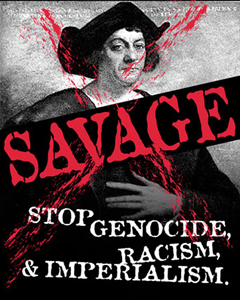 Columbus’ landing in the new world was roughly the equivalent to the Jewish Holocaust during World War II only time has allowed a few more people to drive home the “it never happened” and “Native Americans aren’t real people” messages for so long that some people actually think that celebrating Columbus Day as a national holiday is somehow better than the Iranian president claiming that no Jews died in World War II. In fact it is quite the opposite. Questioning something that is obviously true is potentially bad. But only potentially so. But celebrating the holocaust with a holiday is mockery and racism at its most extreme. Today is an American celebration of genocide, of colonialism, of conquest, of war, of racism, of slavery – of Europe’s darkest hour. This morning was very crazy for Dominica and I. My five o’clock alarm never fired because my phone crashed and had its time indicated as almost seven in the evening! This Palm Treo is total garbage and it turns off the phone portion of its circuitry whenever it feels like and then loses important features like having reliable time. So the phone thought that there was ten hours or so to go before my alarm should go off. Dominica’s alarm clock, coincidentally, was not working this morning and showed it as just being time for her alarm to go off, that is six in the morning, when it was, in fact, almost seven and time for her and Oreo to be on the road. Oops. She didn’t even believe me that something was wrong with the clocks when I first told her. She sauntered into the bathroom and then saw the atomic clock’s accurate time and started rushing to get out the door to the office. I logged in from home and got some early morning work done. I thought about not bothering to do this so that I could rush out to the office faster but my email mailbox is completely full from the weekend’s mail and I can no longer respond to mail from my BlackBerry. So I felt that I really had to log in and get that cleaned up before I could start traveling. So it was later than I had planned which equates to warmer than I had planned when I started walking to the train station. I took the PATH into the World Trade Center and then the subway up to Canal and walked to the shuttle from there. I grabbed a sandwich and enjoyed the moderate morning air before the shuttle shuttled me off to Warren where I am working today. Today is my first day without a car of my own. The Mazda PR5 was dropped off at dad’s house on Friday and has not moved since. I have always had to have had a car to be able to get to work – ever since I was sixteen. This is quite a liberating experience. I can see why so many people are willing to live without a car. It makes you feel so much more free. My day was pretty busy as I was one of just four people in the office covering for twenty to thirty people. Even though a lot of the company had the day off most of it did not and many had no idea that today was a semi-holiday. So we were kept on our toes all day. By four in the afternoon I was the only person in the office which meant that I was exceedingly busy. I had asked my shuttle driver in the morning when the pickups would be and he told me that they were at five, six and seven on the hour with seven being the final shuttle back to Manhattan. I really wanted to catch the five o’clock shuttle as going any later would put be home insanely late and everyone else had left an hour or two earlier so I didn’t feel too bad about going that early. I got stuck on a phone support call until five minutes until five so once I was done I literally ran out the door and hoofed it as which as I could from my office down to the shuttle which is quite some ways away. To my amazement the shuttle had not left yet. Pheww. I boarded and was told that the shuttle wasn’t leaving until half past five. But more importantly – this is the only afternoon shuttle. The two later shuttle runs are canceled, indefinitely. So, had I waited for the completely appropriately late six o’clock shuttle – having left myself an hour of buffer just in case something went wrong so that I could still take the seven o’clock shuttle – I would have been stranded at the office! Talk about bad planning. I came very, very close to being trapped even after making sure that I knew when the shuttles were running and that I had left to catch an early one leaving two after it “just in case.” There were several people on the shuttle quite upset to discover how close they had come to being abandoned at the office. It took over two hours to get home to Newark. Dominica had spent the time between when she got home and when I did cleaning. Jenn is coming to visit tomorrow so we are trying to get the apartment in order to some degree. I got in and we ordered in dinner from Nino’s. We watched a little of The Cosby Show while we ate. Then Min went to bed and I headed out to do some work. I logged into the office and worked for an hour or two. There were several last minute items submitted for me to work on after I had left the office and I didn’t want them lingering until today. So I got that all wrapped up and then went to bed around midnight. Tomorrow I get to actually work, or so the theory goes, from Wall Street in Manhattan. Almost everything is ready for me there.